Place water in a small bowl and sprinkle gelatin over the surface in a single layer. Be sure not to pile it as that will prevent the crystals from dissolving properly. Let stand for 5-10 minutes to soften. Meanwhile, in a medium saucepan, heat cream, sugar, vanilla pod, and vanilla seeds on medium heat and bring just to a boil until sugar dissolves. Remove from heat and discard vanilla bean. Stir in gelatin and immediately whisk until smooth and dissolved. If the gelatin hasn’t fully dissolved, return the saucepan to the stove and heat gently over low heat. Stir constantly and don’t let the mixture boil. Pour cream into 4 individual serving dishes. Refrigerate for at least 2-4 hours, or until completely set. If you like, top with fresh fruit, berries, berry sauce, or lemon curd. Panna cotta can be covered with plastic wrap and refrigerated for up to 3 days. * If using sheet gelatin, use the same weight (7g). Add the sheets to a bowl filled with 2 cups water. 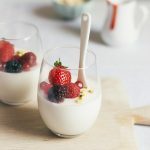 Let sit for 5-10 minutes, then remove the sheets and stir them into the hot panna cotta as directed in the recipe (you don’t need to add it along with the water, such as in powdered gelatin - add the sheets only).